The Festival. Night three. Face the monster. Rather amusingly, something went wrong here and this episode didn’t publish at the beginning of the week when I thought it did! And I wondered why everyone was telling me they couldn’t wait to ready it…! Oops. Social fail. Well, if you do pop by here, I hope you enjoy the read! Charis had balled her fists so tight that the muscles in her wrists began to cramp, but the vampire reached down and wrapped his hands over hers. She struggled with him though he held her tight, and finally she gave up and dropped her head onto his chest with frustration. The crowd was tight around them, chanting for Marilyn Manson to come onto the stage, so tight that she couldn’t escape being in his arms. He didn’t say anything in reply, but neither did he let go of her hands. Charis let her head stay rested on his cold chest without further protest, and she waited as the crowd around them fought for the best spot. August was unmoveable in the mosh pit, the crowd shifted around him like he was a concrete pillar. It was strangely comforting, being held fast in the eye of a storm. Lights exploded into life on a stage that was dressed like the interior of a cathedral as Manson walked out in a long black gown from amongst a collection of stained glass windows, and threw his first chords into the microphone. The crowd thrust forward with vigor, fists in the air. August let go of her, and suddenly they were moving with the crowd again. She turned away the moment he released her and pushed away through the crowd until he made her stop. “Don’t you like Manson?” he asked, surprised. “I like being alive,” she countered. “Why don’t you pretend you do? Just for the moment?” he asked, twining his fingers through hers and pulling her back toward him, “Pretend you are mine, and enjoy this moment with me,” he whispered into her ear. Charis shook her head, fighting the sound of his voice. “I’ve never belonged to anyone.” She told him forcefully, as he spun her around so she could see the stage, and wrapped his arms around her waist. There was little she could do to protest. “Maybe that’s why I like you so much,” he purred. “Don’t kid yourself. You don’t know me at all,” Charis muttered under her breath, knowing he would still be able to hear her. He had pushed a button somewhere inside her, kickstarting a reaction that was raw and ready to happen. She twisted back to face him, wrapping her arms around his neck and pulling him in to a point that was dangerously close, “Would you shut up?” she asked. The warm breath of her words bounced off his icy lips in thin white mist. He didn’t respond, but his jaw softened ever so slightly as he looked down and away from her. Charis wondered for a moment what had caused him to be so repulsed by her now that she was so close. Close enough to feel the locks of his hair tickling her forehead. Close enough to tilt her head up and kiss him. “Perhaps now it is me who owns you?” she whispered, tracing her fingers over his collarbone. Their eyes met, and she could read his expression too easily as he fought for control. Quite unsure of what made her do it, she tilted her head back and pressed her lips against his. His responding inhale of surprise was suffocated by her kiss. Maybe it was her death wish. She found his lips harder than stone, but they moved soft and smooth, and his response tasted like ice off a glacier. Charis pressed herself against him and fought his attempts to manage her. She ran her hands down his shoulders and onto his chest, feeling him shudder as he lost control. A growl eminated from his throat as he dropped his arms away from her shoulders. His right hand wrapped around the back of her neck, while his left raked down her spine to hold at the small of her back and pull her into him, pressing her body flat against his. She arched back, but only to feel him pull her in again. His smile tickled against her lips, and he ran his hands back up to cup her face between them. Then he pulled away, biting his bottom lip and watching her with trembling grey eyes. Somehow they were on the edge of the field, just out of the mosh pit. Charis had no idea how they had moved. She looked around her in surprise and then looked back at him. “You are pretty well controlled for a vampire, aren’t you?” she commented. He growled, letting go of his lip and revealing his fangs, “You have no idea,” came the guttural reply. “I hope you enjoyed that,” he added, sounding a little hurt. “I thought vampires only got excited about blood,” Charis said, rather mildly. “Exactly, and you are, well, you have—” he fumbled over words. “Is your ‘command of the English language’ failing you?” Charis asked, unable to keep her laughter under control as she quoted him. “I could crush your neck with one hand, drain your body of blood in a few short minutes, and you still joke?” He asked, his lips curled back. “Well, what now?” She raised her arms in question. “Peter,” August growled. Charis could see the vice of Peter’s slender dark fingers gripped into her bare shoulder, but he didn’t move from behind her. He held her hostage instead. “Brother, I think you should come with us,” Peter’s hold moved to Charis’ neck, and he wasn’t exactly gentle. Charis winced, and August snarled at Peter. “She is mine.” He told him flatly. “Nice to know you’ve been watching us. We were enjoying a lovely game, until you interrupted,” Charis writhed under his hold. “I actually told him that,” Charis interjected, only to have Peter shake her hard. This time it really hurt, the pressure of his grip was choking. She whimpered a little. “August, shall we go now?” Peter asked viciously. “Do you doubt me brother?” August replied. “Then kill her now.” Peter levelled his eyes at August. “I wouldn’t give you the pleasure.” August’s voice was cool and smooth in the face of Peter’s challenge. Charis couldn’t see what happened because Peter was holding her down, but she heard the two exchange words in a language she didn’t understand, before Peter suddenly released her and threw her toward August. It was a hard throw, but Charis spun around mid flight and lashed an arm back at Peter. In the fury of the moment she didn’t care or consider for the consequences as her nails made satisfying contact with Peter’s face. Either vampires weren’t as fast as the myths suggested, or he was not at all anticipating her retaliation. She landed on August’s chest, and he spun her around to whisk her away, but not before she saw the look of fury as Peter touched his hand to the row of red marks on his cheek. August did not put her down. He moved away from the stage and the crowd fast, and Charis was completely unable to see where they were going for how quick he moved and how tight he held her to his chest. When he did finally stop, he dropped her onto the ground where she collapsed into the wet, dew soaked blades of grass. 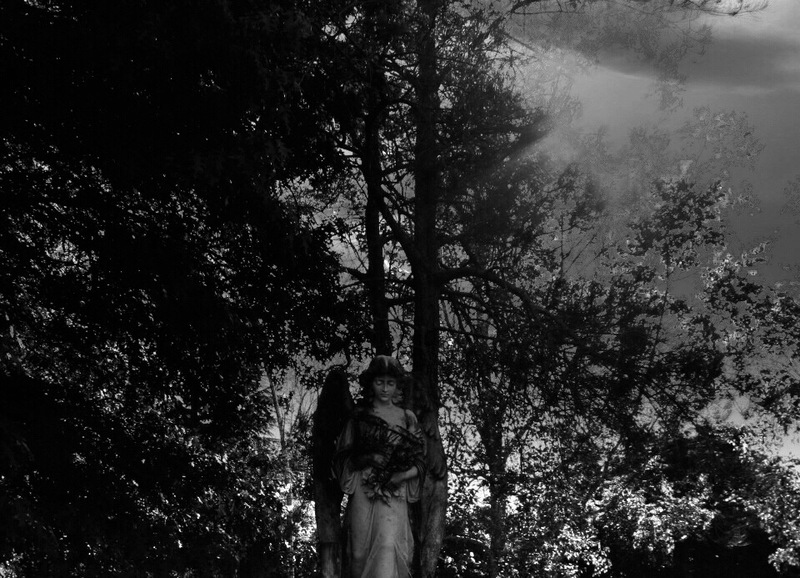 She scrambled to her feet, finding that they were in a moonlight copse of woodland filled with uniform rows of stone angels and crosses. The sounds of the festival could still be heard over the distant hills, but the immediate world about them was as silent as the grave. Charis propped herself up on the tombstone nearest and stretched out all the soreness and bruises over her body. Peter’s hand marks were still felt in heavy bruises across her throat, and her side hurt from where she had been thrown into the solid stone of August’s chest, but otherwise she felt relatively unharmed. “Where are we?” she asked, looking up at August for answers. Previous Post The Festival. Day three. In the end.